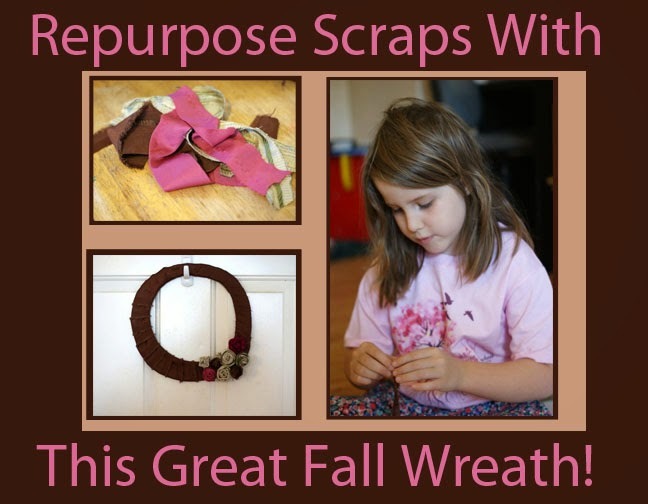 Repurpose Scraps with this Great Fall Wreath! Yesterday R came to me and asked if we could craft together. She wanted to make something for fall. 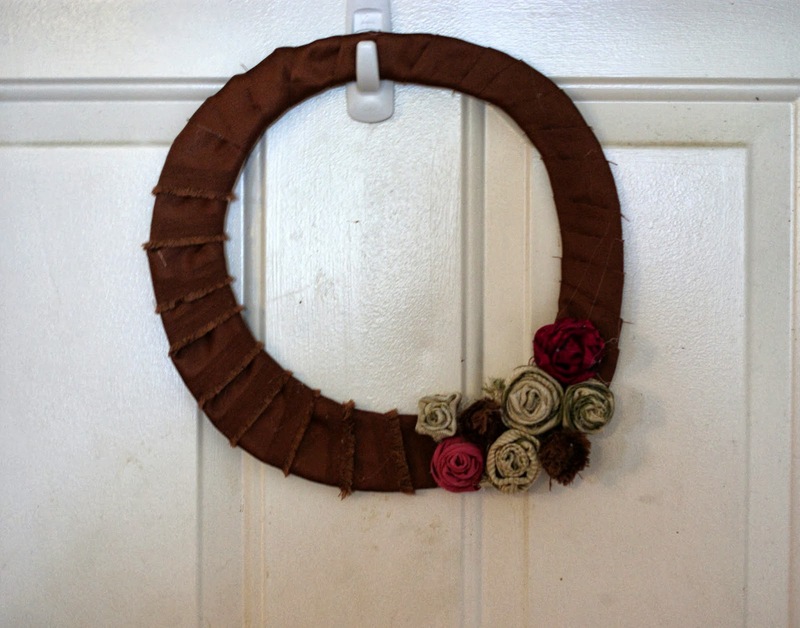 We sat down together and dreamed up this sweet Fall wreath. Fabric – Cut into strips. This can be any kind of fabric you like. Glue Gun – You will need a few sticks of glue for this project. Patience – This is a time using project. Don’t do this if you want something quick. 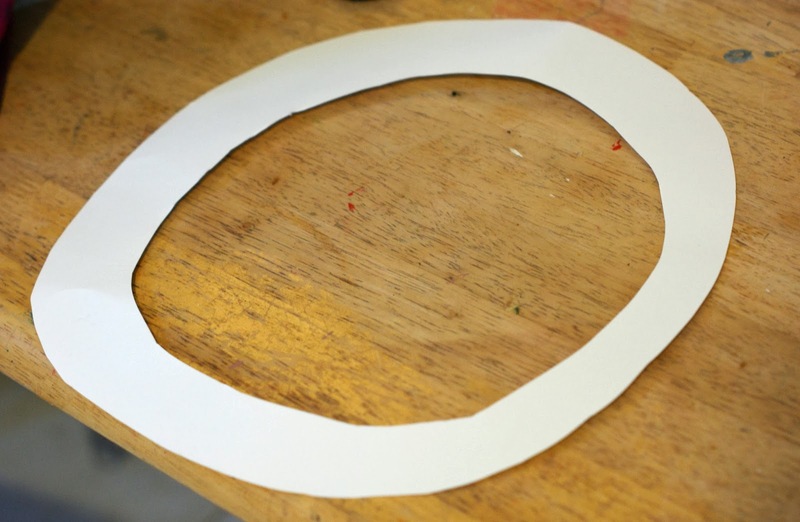 Posterboard, Cardboard, or a foam wreath circle. Cut your board into a circle. I am sure you can make yours a lot more symmetrical than mine. I let my 6 year do it the way she wanted it. 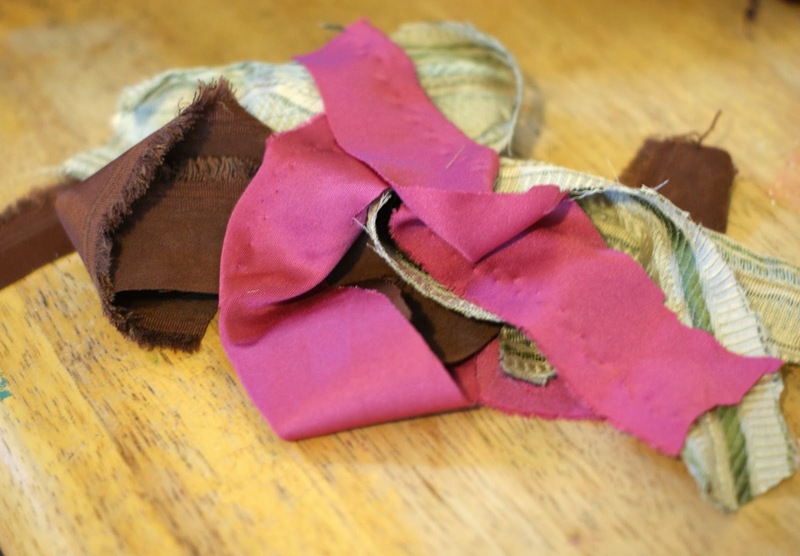 Cut your fabric into strips of varying lengths. You will need to cut enough for your wreath and for the rosettes. 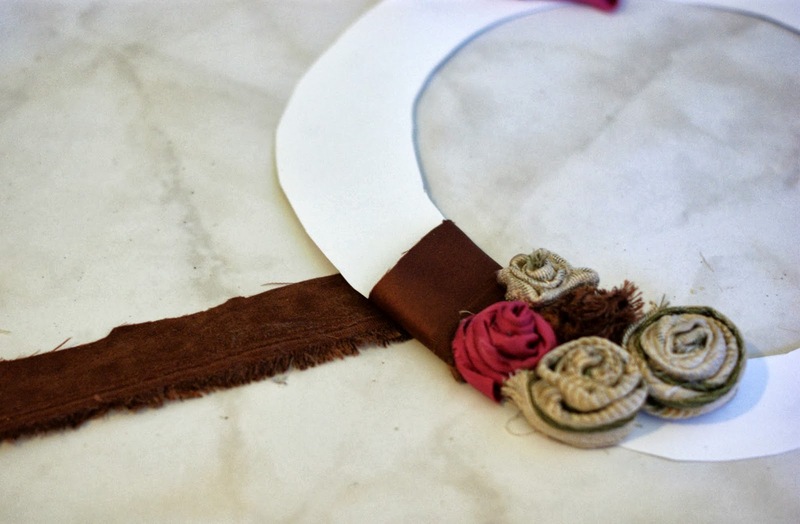 Before making your rosette fold your strip in half. Because R is 6 and she was having a hard time holding it, I glued all of hers in half for her so she would not have to hold them. Roll your fabric strip. You will have to glue it every round or so to hold it tight. You can really use creative freedom here. If you want them tight you can pinch them tight. You can let the frayed end be on top or underneath. 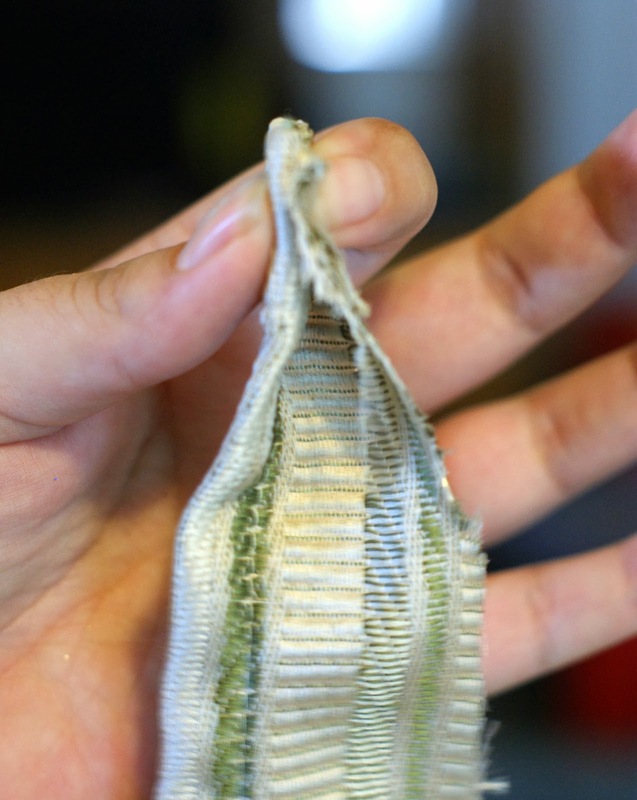 You can twist it as you wrap it for a different look as well. You will end up with something that looks like this. Glue it onto your wreath wherever you would like your rosettes to be. 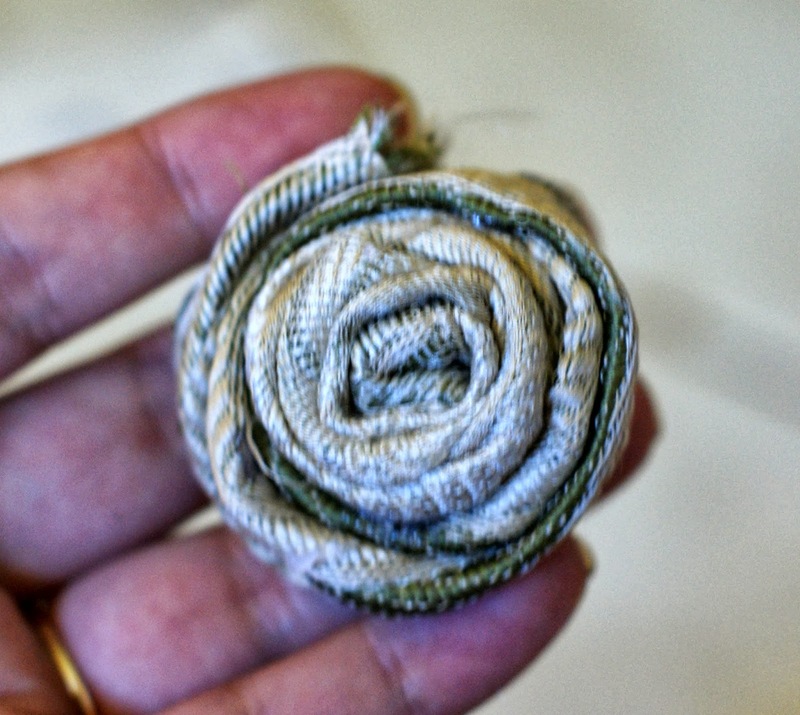 After you have most of your rosettes on you will want to wrap your circle with fabric. I glued mine each time it went around to be sure it would hold well. You can use multiple colors or styles depending on the look you are going for. After you finish wrapping your fabric add a few rosettes to cover up any evidence of putting the fabric on. Hang it up and enjoy. We love ours and it’s just the touch of fall we needed. 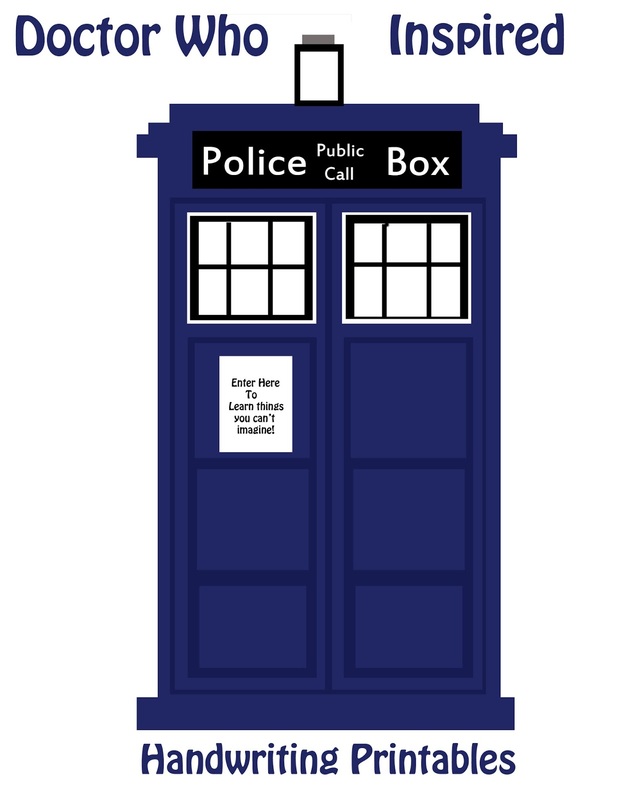 If you have been reading this blog for anything length of time you know I am a fan of Doctor Who. I have received some interesting comments from people about my love for Doctor Who and I do believe it’s time to address them in a letter to the non-Whovians of the world. I understand that we must seem strange to you. We go to events like Time Lord Fest and dress as characters from a show. We spend an entire day talking about the Science, lifestyle, and costuming of this fictional series. We share countless images on your wall, our Pinterest accounts, and on Twitter. We say things like Allons-y, Geronimo, and Fantastic! We also have a strange fear of angel statues, tally marks, and weight loss products. I want to tell you, we aren’t crazy. Well, maybe I am but it has nothing to do with Doctor Who. Instead, we have found a series that is simply amazing! The story line and characters are so well built! I know that the Whovian in your life has been pushing you to watch the show. I know Whovians. Some may have giddly spoken of an all day marathon building it up in your head so big that you were sure the show was going to hand you a million dollars just for watching it. Rest assured, you won’t get rich by watching and your Whovian friend will survive if you don’t love it. Where to find it on Netflix – When you search “Doctor Who” on Netflix you are likely to find two titles. You will find Classic Doctor Who and then you will find one with a brighter blue. You want the newer one. The graphics stink – At first the graphics and production quality aren’t amazing! Don’t be surprised by this. When I first started watching I had to soldier on because I was told it was worth it. I can promise you that as the series progresses so does the production quality. This is Science Fiction – Don’t try to explain away everything. It will not all make sense right away. In fact some things won’t make sense for an entire season. At the end you will have an aha moment that ties it all together. Just enjoy the show for what it is as you watch it. You don’t have to watch it all at once! – Many Whovians will have you convinced that you have to watch the entire series in one sitting. While you may want to after you are successfully hooked you are not obligated to. Give it a few episodes – The story line builds on itself. Basing this series on the first episode is like basing a chocolate cake on one of the eggs you haven’t even cracked for the recipe. Let the show grow on you. If you really don’t love it after a few episodes we will all forgive you and let you move on with your life. Be ready for change. – This series built itself on change. Don’t get too attached to any one element or you will do as many of us do and grieve the loss. If you are the type that will stop watching a show because of the loss of one character, don’t even start this series. It will not end well for you. It can be scary. – Seriously! I am not exaggerating here! There are some episodes I can not watch because they scare me. Don’t worry. You will get thru it. It’s not the demons from the dark abyss or possessed kind of scary though. It’s more get inside your head and make you think scary.